Since the revolutionizing and life-changing introduction of the vacuum cleaner, a home care appliance designed for super suction cleaning, there have been many modifications and augmentations that have occurred to alter the experience of vacuuming. We no longer use the simple manual carpet cleaner by Bissell, but today uses steam cleaners, deep cleaners, hand vacs and more. As such, we’ve learned to clean our carpets with the various tools and chemicals available in our time of modern house cleaning. Home-made carpet cleaning products is a way to control or eliminate harsh chemical components and strong artificial scents. The problem is, a lot of those carpet cleaning solutions and chemicals have harsh substances that are not only toxic but can leave behind reside for your kids or pets to find. But finding friendly carpet cleaning solutions that don’t have dangerous chemicals is not exactly an easy task. Not to worry, though, as there are a few ways to make your own cleaning solutions at home that will get the job done well and without the added concern. If you’re looking to make a carpet cleaning solution at home that is similar to the commercial solutions you can purchase in stores, you can rest assured that this is very possible. This isn’t exactly a chemical-free way of cleaning your carpets but you get to choose the elements that ultimately go into your solution. You can choose to use eco-friendly ingredients that are free of harsh chemicals. This recipe will help you make a carpet cleaner and conditioner solution. If adding a chemical-infused OxyClean product is high on your list of things you’re unwilling to do, you can always get around this by making your own simple homemade version of OxyClean at home, which happens to be quite cost-effective and chemically safe. Notes: Washing soda is basically just like baking soda, but with a PH balance of 11, which is much more effective at cleaning than actual baking soda, which has a PH balance of just 8.1. The popular brand Arm & Hammer is known for making both baking soda and super washing soda. Due to the nature of the substances in this mixture, you should attempt to use it immediately after preparing it. Within a short span of just 4-6 hours, the solution will lose its potency and effectiveness and be all fizzed-out. While a cacophony of chemicals may be the very thing you want to avoid in your carpet cleaners, sometimes a simple solution with just one basic chemical, like ammonia, can do the trick. Although this one isn’t exactly a non-chemical cleaner either, it utilizes a simple chemical mixture that can deliver some seriously powerful results. However, the main chemical, ammonia, can be highly corrosive to your skin, lungs, and eyes, so it should be handled with extreme caution. The risk it poses decreases once the ammonia has been diluted by the solution mix. Notes: Use gloves when combining this solvent mixture. 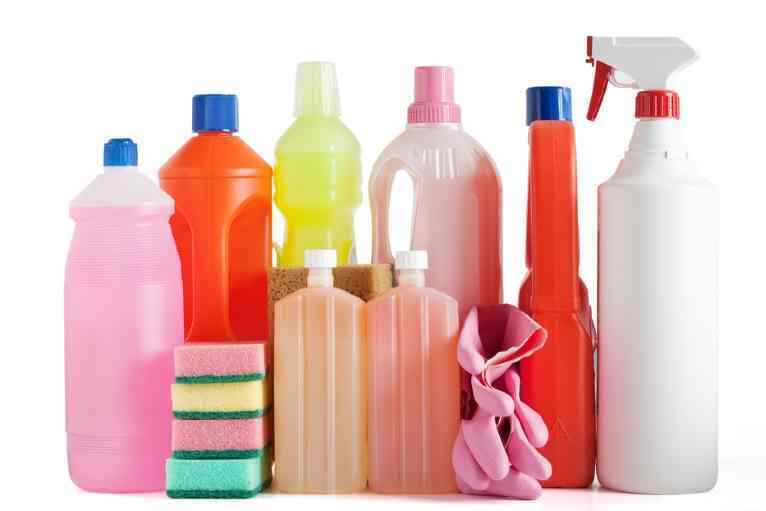 If the homemade synthetic ingredient-based cleaners still seem like too much chemical to your liking or still seems too inorganic, there are other more organic and non-toxic solutions you can try at home. This one is a great cleaner for disinfecting and deodorizing your carpet without the use of any harsh or inorganic chemicals. 15 drops of your choice of essential oil. We recommend lavender, pine or lemon. Notes: White vinegar has been used as a disinfecting cleaning agent for centuries, as it has many amazing applications and does a great job of neutralizing bacteria. We don’t often realize it, but our kitchen is actually full of ingredients that can be used to clean stubborn stains, messes and more. Here are two ridiculously simple solutions that can get almost any stain out of a synthetic carpet. Notes: Be sure to dip a non-colored cloth into the solutions and then apply them to the stain. Applying them directly to your carpeting could cause unwanted damage. If you have carpet with natural fibers, you don’t want to take the chance with solutions designed for the synthetic stuff. Instead of the dip and blot method of removing stains for synthetic floor fibers, a solution misted from a spray bottle is a better way to treat your natural fiber carpet without ruining it. Here are three incredibly simple solutions for your spray bottle. Notes: Spray mist directly to stain and let sit for a few minutes before you attempt to blot it out. If you have a greasy carpet mess you’re looking to clean, and the above solutions don’t seem to be working for you, here is another solution formula that is proven for fighting grease. Notes: This solution uses hydrogen peroxide, which loses its effectiveness and potency the longer it is exposed to sunlight and oxygen. Therefore, this mixture should be used up immediately or be stored in an airtight and opaque container to preserve its usefulness. All the above solutions can be used in place of the store-bought chemicals designed for the purpose of carpet cleaning. When trying out a new solution, first test it in an inconspicuous part of your carpet. This will help you make sure that your carpet won’t be damaged by the solution before you try cleaning a large area with it. Be sure to use gloves and a clean cloth for blotting and dabbing. Finally, be sure not to rub and ruin your carpets when attempting to get them clean. Instead, use a gentle dabbing method and generous doses of your chosen solution where necessary. Some stains may require multiple applications of cleaner before they are lifted.